Common perception is that once it's been contained, the impacts of a forest fire no longer exist. Unfortunately, the reality is that the initial fire, while both damaging and dangerous, is only one part of the threat to both mankind and nature that results from a wildfire. Soil becomes exposed from forest fire and no longer has vegetation coverage to hold the soil in place. Wind and rain quickly sweep away soil in massive amounts with every storm event. The end result is that the top layers of the best soil is washed away, leaving only hard-packed soils that are difficult to successfully replant. Erosion control fabrics like coir mats help prevent erosion by slowing the rate of flow over the ground, as well as retaining water and providing protection to encourage the establishment of new plant growth. Intense heat from forest fires chars the soil. The resulting impact is that the soil is coated with an oily surface that's impermeable to water. This condition is called hydrophobicity. While most healthy soils have a layer of organic matter that helps it absorb and retain water, hydrophobic soils will not absorb water. This creates a heightened amount of stormwater runoff in areas affected by forest fires. Flooding is a common and serious risk in post-forest fire sites. Additionally, the resulting high volume of water runoff also often translates into dangerous mudslides, especially in locations with steep slopes. Erosion measures such as coir logs or straw wattles can be used to slow stormwater flow, as well as for bank stabilization. Staked Turbidity Fence is effective in directing (and slowing) stormwater flow, while Silt Fence filters the runoff before it exits the property. Another serious consequence of forest fires is the impact that sediment-laden stormwater runoff has on the waterways and water systems downstream. As long as the soil in a wildfire area remains unstabilized, it will be picked up by stormwater runoff and carried downstream to settle in ponds, lakes, reservoirs and other bodies of water. Sediment laden water's danger to the aquatic ecosystem is significant, and often gains the attention of the EPA and other regulatory agencies. Additionally, following a fire, the compounds in the stormwater runoff contribute chemicals to the water that aren't normally significantly present and provide an additional negative impact to the ecosystem. Besides damaging the aquatic ecosystem, wildfire runoff also impacts the quality of water supplies for local communities. Stormwater control and filtration products, like: ditch check, silt fence, and turbidity curtain can help address water pollution from wildfire runoff. Left unaddressed, these risks cause additional environmental and property damage, and even loss of life. Beyond the financial impact of these consequences from forest fires, there's also a likelihood of fines levied on the responsible parties by regulatory agencies (like the EPA) for neglecting to address the concerns before they have a broader impact. For more information on the impacts of forest fire, see: Wildfire Impact. Do you have questions about wildfire recovery? Contact GEI Works at 1-772-646-0597 for answers! The good news is that these conditions can be addressed as part of a wildfire recovery plan before they become bigger and more costly problems. Wildfire recovery plans are typically implemented immediately after a fire, and stay in place for as long as it takes to re-stabilize the area impacted. This doesn't mean that the area's been fully restored, only that the soil and habitat has been stabilized from the impact of the forest fire. This can take takes 5 years or more. The first and most important act after a fire has run its course, is to implement erosion control measures. When applied appropriately, this simple step in your wildfire recover plan will help in preventing all three of the consequences listed above. The erosion control measures will secure the soil, providing time and an environment that will promote revegetation (with your help). Erosion control is the short term answer - revegetation is the long-term solution. Both are needed for successful mitigation of the impacts following a forest fire. For suggestions on erosion control solutions, please see: Erosion Control After a Forest Fire. 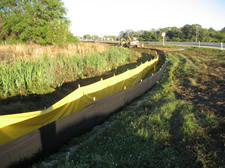 To minimize and control the damage on water systems of unmitigated runoff filled with sediment, turbidity barrier is the industry recognized best management practice. Turbidity Curtain contains the polluted water, preventing it from affecting the larger water system. It is contained until either the sediment and pollutants settle, or they are otherwise addressed. Additional options for addressing the impacts of forest fire can be found at: Forest Fire Impact Mitigation. For additional information or assistance in selecting the right forest fire recovery products for your site, please contact us at 1-772-646-0597 or fill out a request form.